For this Month’s Monthly Mingle it is a taste of yellow tribute to Barbara from Foodies & Winos, who sadly passed away losing a long battle with cancer. I didn’t know Barbara well but when whenever we did chat she only ever had kind words and a warm heart. All the wonderful posts and tributes of the last few weeks are testament to what a lovely woman she was. So given my heavily laden lemon tree it had to be something with lemon. I have a few cookbooks so some do end up at the back of the shelf gathering dust rarely seeing the light of day. That is until I came across Eat Your Books. My very own virtual cookbook shelf. So I cam just pop in “lemon cake”, hit search and all the lemon cake recipes in all my cookbooks appear. 60 in all, so yes maybe I have more than a few cookbooks. However, until I have as many as Nigella, I have convinced myself I don’t have too many! Eat Your Books is a great way to lead you to dust off some of those cookbooks gathering a little too much dust. I had the pick of frosty lemon cakes, golden lemon coconut cakes, lemon meringue cake, lemon poppy seed cake, lemon verbena cake just to name a few. However I couldn’t help but stop at walnut, lemon and cardamom cake from Moro The Cookbook. This time Eat Your Books had lead me back to one of my favourite books that rarely gets a chance to gather dust, but on other occasions it has lead me to discover some hidden gems lurking at the back of the bookshelves. Who could go past this flavour combination? I love lemon and I love cardamom so there was no contest. It is also gluten free if you are ever looking for a lovely dessert sans gluten. Spray a 25cm / 10inch spring-form pan with a little oil and line with baking paper and place on a baking sheet. Spoon the mixture in to the prepared tin and place in the oven for about 90 minutes. When ready the cake will be golden on top and just firm in the middle. Remove from the oven and cool on a rack before removing from the tin. *Cardamom is a quite an intense flavour. It is very aromatic and one that I love so I added about 4 teaspoons. For less intensity just add a little less, however a good hit of cardamon does add a wonderfully exotic note to this cake. Perfect on its own or served with a dollop of yoghurt. It is a crumbly cake so don’t fret if you don’t have the perfect slice, it really is all about the flavour and with this cake the texture too. Every bite is a happy party of tastes and textures. The flavours are wonderful, the fragrant cardamom and the brightness of all that lemon are a perfect match. And then there is all that nutty goodness that make this one quite exceptional cake, the polenta adding another layer of texture to boot. 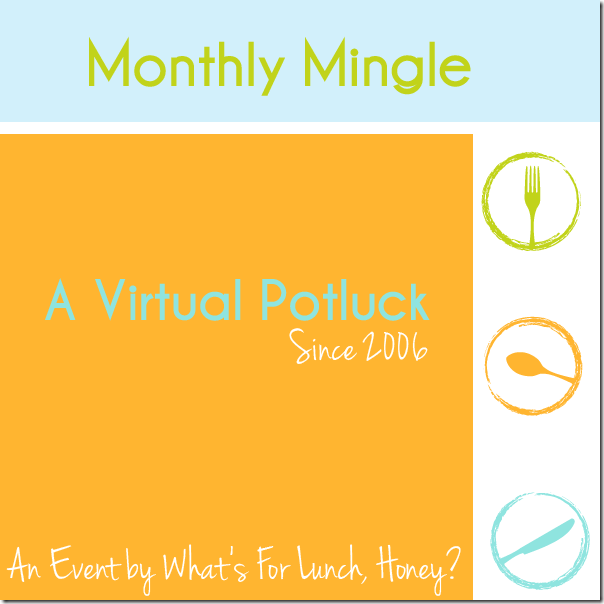 This is my entry for the Monthly Mingle set up by Meeta over at What’s for Lunch Honey? 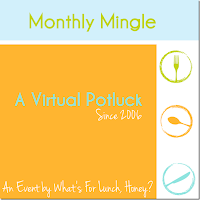 and this month hosted by Jeanne over at Cook Sister. Lovely cake and lovely dedication to Barbara, who liked lemons! You could also enter it to Sweet NZ :-)! Thanks Alessandra....entry for Sweet NZ being baked today!! Lovely tribute and cake Mairi. We really must catch up again soon! Thanks Alli, yes we must....will get on to organizing next blogger catch up...today! A beautiful tribute to Barbara! Thank you so much for joining us Mairi! Thanks Meeta, must make sure to join in more often. What a wonderful cake and one Barbara would have loved! Nuts, polenta and lemons seem to have been created to be baked together. Right? Gorgeous cake! Oh, Mairi, I can't pass up this flavor combination. What a beautiful tribute to your friend. Thanks Kristina, yes you do need Eat Your Books!! I reckon the minister of finance must allow that as it will encourage cooking from all your cookbooks!!! Thanks Jemma, I seem to be addicted to cardamom at the moment. Hi Mairi, what a lovely sounding cake - I am a sucker for cardamom. I don't seem to have received an e-mail from you submitting this to the Monthly Mingle, but I saw the pic on the Pinterest board - hope you don't mind my including it? Hi, thanks Jeanne, all good! Hi Mairi, thanks for following, I've been looking through your site and this cake looks amazing! I have a whole bunch of fresh walnuts that need cracking and I'm curious to see how good fresh walnuts taste when baked! Looking forward to trying it! Thanks....yes I did like this cake....love the cardamom.